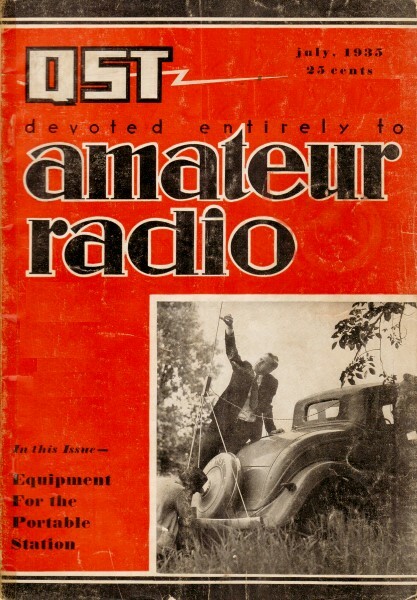 These two advertisements appeared in the July 1935 edition of QST. Bliley Electric is still in business here in Erie, Pennsylvania as Bliley Technologies. They make crystals and frequency sources. Gross Radio has been out of business for quite a while. I included it mainly to illustrated how large radio transmitters used to be - these things were installed in people's attics and basements back in the day. This particular model, the CB-100, is a "100-Watt Radiophone & C.W. Transmitter completely housed in an entirely enclosed floor rack of ingenious design." It operated in the 1.7, 3.5, 7 and 14 MHz bands. For comparison, iCOM makes a 1 kW power amplifier today covering those bands that measures roughly 6"(H) × 3"(W) × 9"(D) and weighs 55 lbs. 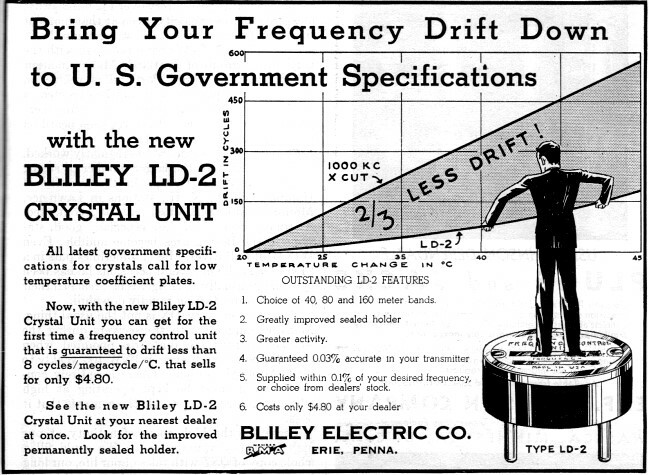 See more WWII era electronics company ads in QST, and another Bliley ad in a 1945 Radio News issue. All latest government specifications for crystals call for low temperature coefficient plates. 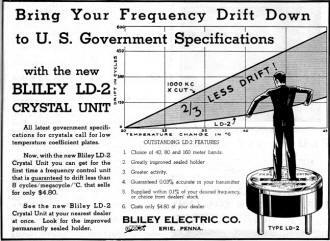 Now, with the new Bliley LD·2 Crystal Unit you can get for the first time a frequency control unit that is guaranteed to drift less than 8 cycles/megacycle that sells for only $4.80. See the new Bliley LD·2 Crystal Unit at your nearest dealer at once. Look for the improved permanently sealed holder. 1. Choice of 40. 80 and 160 meter bands. A 100-Watt Radiophone and C.W. Transmitter completely housed in an entirely enclosed floor rack of ingenious design. All units are fully accessible through the removable front gates, for coil changing antenna network adjustments, etc. incorporates everything from microphone leek to impedance matching antenna network. - R. F. LINE UP- 47 crystal oscillator, two 46's buffer, 03-A amplifier. - FREQUENCY COVERAGE - 1.7, 3.5, 7 and 14 MC Bands. - POWER SUPPLIES - 1050 and 1200 volts at 400 MA choke input, 8 mfd Pyronal condenser used and 400 volts at 300 MA. - SPEECH AMPLIFIER - Special four stage high gain speech amplifier self contained from micro­phone jack to gain control. - MODULATOR - Two 800's are used in the Class B Modulator. 100% modulation. - BIAS - No bias batteries of any kind required. - ANTENNA UNIT - Impedance match­ing network supplied for use with any type of antenna available. - OPERATING CONTROLS - Ter­minations provided for operating all switches from oper­ating table. - SIZE - 60" high, 19%" wide, 16" deep. Class B Modulated Radiophone Transmitter 250 Watts Output. Attractively Priced. Gross Radio's Engineering Department is under the direct supervision of J. Gross who has had over 20 years experience in the construc­tion of transmitters of various types. Mr. Gross has for 12 years been actively engaged in manufacturing transmitters. The first crystal controlled transmitter advertised in OST was designed by him. Ultimately, the long experience and fine reputation of the company you buy from is your best guarantee of satisfaction.